Select Mall to advertise	 Please select... Alpha Mall - Cinepolis Cinemas Celebration Mall - Cinepolis Cinemas Mittal City Mall - Cinepolis Cinemas Republic Mall - Cinepolis Cinemas TDI Mall - Cinepolis Cinemas MBD mall - Cinepolis Cinemas Prestine Mall - Cinepolis Cinemas Bestech Sqaure Mall - Cinepolis Cinemas Oops! Cinepolis Cinemas is not present here. Why Cinemas Advertising in Punjab? Punjab, the 16th largest state compromises of 22 districts and is well-known for its classy culture, festivals, cuisine and what not for. With top-notch universities like Punjabi University, LPU, Guru Nanak University, Chitkara University, and many more leading colleges & historic monuments with famous tourist places, Punjab has a massive range of people from students to business owners. Coming to the industry & Market phase, Punjab has an extensive range of world-class industries famous for the production of cricket bats, textile, agriculture and many more. With eminent & big malls equipped with high infrastructure the state targets huge population & combination of people coming from different age group and backgrounds making it a Shopping hub as well as a Transit Hub. Coming on the way to advertise and market your brand, the most vital way of advertising in Punjab is to promote it through Cinemas Advertising. There are two most famous cinema chains in Punjab, i.e. PVR Cinemas & Cinepolis Cinemas. Why Advertise in PVR Cinemas, Punjab? Advertising in PVR Cinema with over 50 screens in Punjab not only promotes & market your brand but also introduces your brand to the premium captive audience of cinemas. Cinema Advertising costs less as compared to other advertising mediums and gives you a better platform to reach a massive audience. Why Advertise in Cinepolis Cinemas, Punjab? 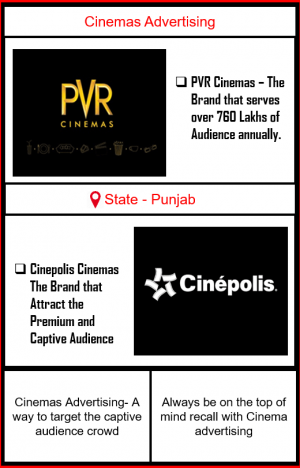 Advertising in Cinepolis Cinema with over 40 screens in Punjab gives you a magnificent chance to target premium captive audience towards your brand and create a huge brand recall with grand ROI (Return on Investment). 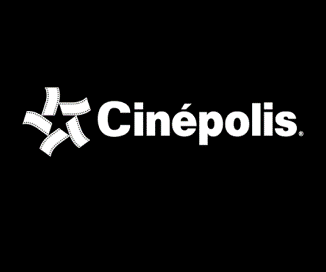 Cinepolis Advertising offers you the way to promote your brand on silver screens and get the most out of your cinema advertising campaign. “BIG MEDIA KART” the leading cinemas advertising agency in Punjab is a professional platform which offers you the best guidance to promote your business and take your brand to new heights. Advertise & promote your brand PAN India with our special and cost-effective packages made specifically to match your customization.